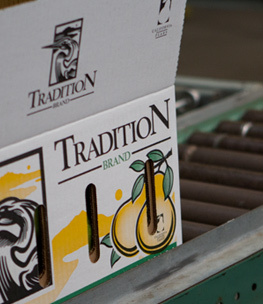 To ensure that every piece of fruit meets our high standards and our customers’ expectations, we voluntarily put our orchards and packing houses through a rigorous food safety program. This third-party inspection and verification process is conducted throughout our production and supply chain to verify that our produce is grown, packed, handled and stored in the safest manner possible. As a result, our orchards are certified for Good Agricultural Practices at the Global GAP level. Our packing houses and cold storage facility are certified for Good Handling Practices at the GFSI level through Primus GFS.